This feature allows you to add either static or draggable popup currency converters to your web pages and allow you to modify the look and feel to match your site. Because the YourCurrencyConverter.com system features automatic country detection, the popups and static converters will always default to convert FROM the currency you have selected as the currency of your website and they will default to convert TO the currency of the person visiting. This gives you a very powerful currency converter for your website, which is easy to use and allows your visitor to convert currencies without leaving your website. All currencies are called from our servers, which are kept up to date every 8 hours - so your prices will also reflect the current market rate. You can have as many popups or static converters on as many pages as you like. Selecting this option will allow you to add a dragable popup currency converter to your site. The text that is surrounded by the span tag will be used as the link text and the popup will detect whether the link is a valid currency and prepopulate the 'Convert' input field. You can use this SPAN tag around dynamically generated prices if your content management system or shopping cart system allows it. 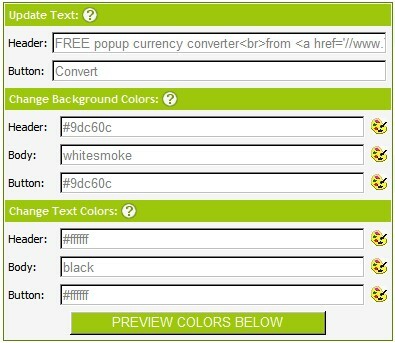 You can remove the YourCurrencyConverter branding and can customise the colors used to match your site. Selecting this option will allow you to add a static currency converter to your site. 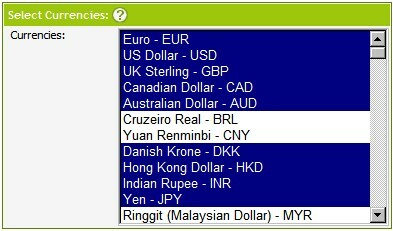 You have the option to remove the YourCurrencyConverter branding and can customise the colors used to match your site. Select the currencies you wish to have displayed within your converters. Figure 5.3 Update Text, Change Colors and Preview. This section gives you the functionality to change the look and feel of the popup and static converters to match the look of your website and to remove YourCurencyConverter.com branding header. To change colors you can either enter the name or code of the color of click on the palette icon to the right of the text box to bring up a draggable color picker to choose from a wide selection. Whenever you make change click on the 'PREVIEW COLORS BELOW' button to see the affect of you change. You have the ability to modify background and foreground colors as well as header and button text.